News / Politics Which Democrat would make a better president for black Chicagoans? Two delegates debate. Jaylin McClinton, left, is a delegate hopeful for Hillary Clinton. Tara Stamps, right, is a delegate candidate for Bernie Sanders. 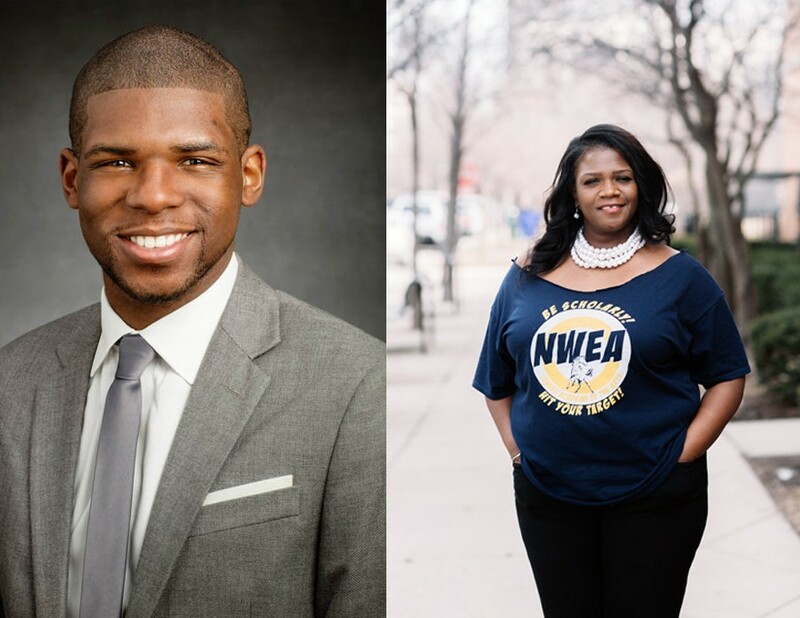 Tara Stamps and Jaylin McClinton are both politically active black Chicago Democrats from communities that are predominantly low-income and racially segregated. But they're in different camps as the Illinois presidential primary approaches. "Black people need a revolution," Stamps says. "Bernie Sanders speaks to the revolution that is necessary in this country." "I want a president who will be able to get things done from day one, and who can work across the aisle," McClinton says. He doesn't mean Sanders. Stamps, a 47-year-old public school teacher who lives in Austin, is a delegate candidate pledged to Sanders. McClinton, a 22-year-old University of Illinois senior from Roseland, is a delegate candidate pledged to Hillary Clinton. They're on the ballot in their respective congressional districts, hoping to be among the 102 district-level Illinois delegates who will represent their party at its national convention this summer. The 18 congressional districts in Illinois are apportioned from four to nine delegates apiece by the Democratic Party. The greater the population in a district and the larger its Democratic vote in recent elections, the more delegates it's allotted. The district-level delegates are chosen in proportion to the vote for their presidential candidate within their districts in the March 15 primary. In the Seventh congressional district, for instance, nine delegates are at stake, and Clinton and Sanders each have nine delegates pledged to them on the ballot. If Clinton gets two-thirds of the vote and Sanders one-third, the six Clinton delegates who get the most votes, and the top three finishers among the delegates pledged to Sanders, become delegates for the national convention. Right now it looks like many more Clinton delegates than Sanders delegates will be heading from Illinois to Philadelphia in late July. A Tribune poll published Tuesday showed Clinton trouncing Sanders in Illinois, 67 percent to 25 percent. A poll of Illinois registered voters in mid-February had Clinton leading Sanders 51 percent to 32 percent, with 16 percent undecided. Then again, many polls in Michigan had Clinton winning by 20 percentage points or more—and on Tuesday, Sanders won that state, 50 percent to 48 percent. Clinton has rolled up several big primary wins in the last few weeks, in part because she's fared so well among black voters. That support annoys Stamps. Clinton "believes she has this right to the black vote that she has never earned," Stamps says. "I'm very frustrated about my people who would blindly throw their support behind her." "Senator Sanders is a New Deal kind of Democrat," Stamps says. "He believes government has a responsibility to its citizenry. He realizes that if people are supposed to pull themselves up by their bootstraps, they have to have the boots." She appreciates his proposal to make tuition free at public colleges. She was a single mother when she attended college, as is her daughter now. "It's very expensive. We say we want an informed, intelligent electorate, but we're not willing to invest in education so that we'll have one." Stamps also points to Sanders's constant "attack on Wall Street," and says he's right to warn that "the super rich are buying up our democracy." Clinton, she says, is the kind of Democrat who believes that "the public sector needs to partner with private interests for the common good. The common people have done nothing but suffer under that theory." McClinton, who's attending U. of I. at its Urbana-Champaign campus, had an internship in the office of Democratic state senator Michael Frerichs in 2014, when Frerichs announced he was running for state treasurer. McClinton's exposure to Frerichs's victorious statewide campaign heightened his interest in politics. Last year, even before Clinton announced, he let her grassroots organizers know he'd like to do volunteer work for her campaign. He thinks he was picked as a delegate partly because he got his foot in the door early, and also "because of optics—because I'm a young black man." Unlike Stamps, McClinton is quick to praise the opposing candidate. "I definitely feel the Bern—the issues he's raising are very important. But I'm with Secretary Clinton this time around." He thinks she's "more well-rounded" on the issues and more willing to negotiate, which he says is essential since both houses of Congress aren't likely to be Democratic. He notes that one of Clinton's three senior policy advisers, Maya Harris, is a black woman. Clinton "has advocated for progressive policies in theory, but she's also using her resources to file lawsuits in states that have been infringing on people's right to vote," he says. Sanders has "hands-down way more support" than Clinton on the U. of I. campus, McClinton allows. But many of his friends are undecided, and he's been lobbying them. "When you hear 'free college,' you're instantly excited, but you have to look at the details," he says. He tells his black friends in particular that he worries about the impact on historically black, private colleges of making public colleges free. He also advises his friends to focus not just on Sanders's lofty ideas, but on what is "feasible." He thinks Clinton's experience and pragmatism make her more likely to develop "tangible solutions" that will "help places like Roseland build up their local economy." The emphasis on pragmatism by Clinton supporters is "lazy thinking," Stamps says. "I believe in the power of the people. Bernie believes in the power of the people. Hillary's supporters may not believe in the power of the people. They're willing to settle for what they think they can get when they should be thinking about what they're willing to fight for." Stamps will host a party for Sanders a few days before the primary "to talk to my neighbors about why I have Sanders signs in my windows." She'll spend election day bringing Sanders supporters to the polls. McClinton meantime will be working on mobilizing Clinton supporters on the U. of I. campus. McClinton was elected last year to the U. of I. board of trustees as a student representative. He plans to attend law school; he'd like to become a public interest attorney and work on voting rights issues or criminal justice reform. He dreams of a federal judgeship, but running for office also interests him. "You have to start somewhere," he says. "I'm volunteering my time and paying my dues, which will help me in the future." Stamps's political activism will likewise continue beyond this election: she plans to run for alderman again in 2019. McClinton and Stamps are in accord about the other party's presidential campaign. "People like Donald Trump, who's attempting to instill fear, are really concerning to me," McClinton says. "It's been mind-blowing to me that he's been able to win so many states." Stamps says, "You look at the Republican candidates and you think, 'This is the best y'all got to offer?' And the most ridiculous person is leading? A person who spews venom that is [George] Wallace-like and Hitleresque? That's very scary to me."